June 7, 2007 The original technology demonstration was presented at the 5th International Symposium on Digital Earth (ISDE5) at the University of California Berkeley. October 30, 2007 The design science solution inspired by Buckminster Fuller's concept for a Geoscope was submitted as an application for the Buckminster Fuller Challenge. January 11, 2008 My entry advanced to the second stage of the selection process. See notification letter below. The term SPHERIPHOR and the special spelling SPHΘRIPHΦR using the Greek letters phi (Θ) and theta (Φ) are trademark words coined by the author/inventor Thomas J. Greenbaum as a compound of the words "SPHERIcal" and "metaPHOR." 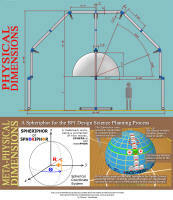 Included in the Spheriphor Studies are 3D images and animations rendered with POV-Ray. Examples of POV-Ray scene description language source code is provided "as is" for the reader to use and experiment with. We are delighted to inform you that your entry to the Buckminster Fuller Challenge has advanced to the second stage of the selection process and is still in the running to win the prize. Twenty-four entries in total have been advanced to this next stage of our selection process. The 250 entries to the Buckminster Fuller challenge showed a very broad and varied set of initiatives, all characterized by a strong sense of purpose, stewardship and humanitarian activity. The privilege of reviewing such a demonstration of civic responsibility, innovative initiative, and creativity has been deeply inspirational. Stage two of the selection process begins mid-January. We are in the process of contacting your references, and in the event we need assistance in doing so or requi re additional information about your entry, we will be in touch with you. We anticipate stage two of the selection process to conclude mid-April and the winner of the first Buckminster Fuller Challenge to be selected shortly thereafter. On behalf of the members of the board and staff of the Buckminster Fuller Institute, thank you for your dedication to making the world work for 100% of humanity.